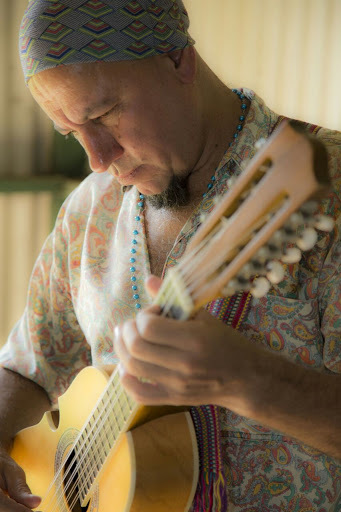 Nibs van der Spuy has been described as one of the most extraordinary and exciting, world acoustic guitarists and exports to come out of South Africa. Raised in the fertile province of KwaZulu-Natal, he immersed himself in his natural environment to formulate a truly consummate and original sound. Growing up with the Beatles and learning first-hand from traditional Zulu Maskandi guitarists, he quickly soaked up a rich tapestry of his close surroundings and beyond. His third solo release, Beautiful Feet received highly acclaimed accolades around the world where it was album of the month in four German publications and RADIO FRANCE FIP pick of the week. Van der Spuy continues to spread his musical beauty around the world where he has shared stages with the likes of Ben Harper, Bonnie Rait, Taj Mahal, Gito Baloi, Kelly Joe Phelps, Piers Faccini, Phillip Henry & Hannah Martin and Shawn Phillips and recording the critically acclaimed, In the shade of the wild fig, with long-time friend and collaborator, Guy Buttery. In September 2016, van der Spuy released his new solo album, Natalia, produced by world renowned producer Mark Tucker (Portishead, PJ Harvey, Jethro Tull). He will be giving a one off solo concert at St Clements, on June 2, 2018. "I haven't played a show at St Clements for many years and feel incredible excited to be invited back. I have memories of some of the most beautiful performances of my career there. I will be coming home with a suitcase of new songs and inspiration and couldn't have asked for a better place to perform them."